Pinnacles Provincial Park comprises approximately 124 hectares of pine forest overlooking Baker Creek. The park is a popular day-use area and is easily accessible from Quesnel. From the Pinnacles viewpoint, visitors enjoy the unique formation of “Hoodoos,” and a picturesque view of the city of Quesnel and Baker Creek. The park is open year-round for day-use and sightseeing despite the locked gate at the entrance; camping is not permitted. The park provides an opportunity for a pleasant 1 km hike along a well maintained trail to the viewpoint; allow 15 minutes for access. Horseback riding in the park is not permitted. The hoodoos are fragile, please do not climb on or near them. The viewpoint is an area with steep cliffs. Please exercise extreme caution and stay in designated viewing areas. 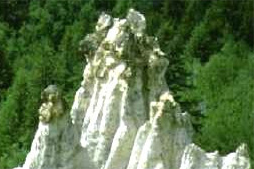 Climbing on rock formations accelerates erosion and destroys the scenic value of the area. Please view the hoodoos from the established viewpoint only; remain behind the fence. The park is located 8 km from downtown Quesnel. It can be accessed via Pinnacles Road (paved) in west Quesnel off of Highway 97. For additional map information, please refer to topographical map number: 1:50,000 93B/15. Conservation: Pinnacles Provincial Park protects a very unique formation of hoodoos. These hoodoos began their formation 12 million years ago, when molten lava flowing over the earth’s surface cooled in flat basalt layers over older layers of ash and rock. The Ice Age followed, and when the ice mass receded, melt-water streams eroded the valley below Pinnacles Park. The hoodoos are formed from the effects of this natural erosion and weathering. The basalt is eroded away, revealing the more resistant ash layer, and often producing vivid bands of color as individual basalt layers are removed. The hoodoos at Pinnacles Provincial Park are fragile, since they are still undergoing these forces of erosion and weathering. The Pinnacles viewpoint provides an unobstructed view of these impressive geological formations. Approved Purpose Statement and Zoning Plan [PDF 33.76KB] for Pinnacles Provinical Park is available online in pdf format. The park provides an opportunity for a pleasant 1 km hike along a well-maintained trail to the viewpoint; allow 15 minutes for access. For your own safety and the preservation of the park, obey posted signs and keep to designated trails. Shortcutting trails destroys plant life and soil structure. The park provides an opportunity for a pleasant 1 km hike along a well-maintained trail to the viewpoint of the hoodoos. This park only has one pit toilet located near the viewpoint – no flush toilets.